A cup of tea and a piece of cake - such a great partnership that I decided to combine the two! I made this cake for a friend's birthday as she is a real tea connoisseur. She's vegan so I also had to make sure the cake was dairy-free. I flavoured the cake with tea - I was going to use earl grey but then found I had some strawberry-flavoured tea bags so decided to use those instead. I covered the cake with fondant and decorated it to look like a tea pot, but it isn't quite as neat as I would have liked, which I will explain later. The tea cup next to the teapot is a cupcake made from the same cake mixture. I don't think this is as good as some of the other vegan cakes I have made but I loved the idea and my friend was really pleased with her birthday cake. - I played around with the quantities but as a general rule you need about twice as much icing sugar by weight as you do to marg. Preheat the oven to 180C. Mix the flour and baking powder in a large bowl and open the tea bags and sprinkle the tea into the bowl. I also added a little pink food colouring to go with the subtle strawberry flavour of the tea. To make a cake that looks like a teapot, you need a round cake. You can either make the cake in two pyrex dishes, which you can bake in the oven, or you can buy hemisphere cake pans, for instance from Lakeland, or I have this Wilton sports ball tin. The tin is very good because it comes with two halves and a base to stand them on while they are in the oven. Grease the cake tins and spoon in the mixture. Bake in the oven for around 30 minutes, though it will depend on the size and depth of your cake tins. Allow to cool on a wire rack. I love how these are perfectly shaped! Mix the buttercream; again I added some pink food colouring and a little bottled strawberry flavouring. Spread over one half of the cake and sandwich the other half on top. However it is important not to use too much buttercream; I used quite a lot and it meant that the top of the cake slowly slid off to one side, only slightly but this is why the finished tea pot cake looked rather uneven. Spread a thin layer of buttercream around the outside of the cake as well. Roll out 1kg of white fondant and use to cover the cake - you can see where again I had too much buttercream and a little started to come through the fondant at the bottom. After trimming the excess off the sheet of fondant after I had covered the cake, I used the rest to make a handle, spout and lid. I found it easiest to let the spout air dry for about ten minutes so it stiffened a little, and then attached it with edible glue. You can also use cocktail sticks for extra support, but either make sure these are removed or that the recipient knows they are there before the cake is eaten! I used an icing bead maker which I bought in the Lakeland January sale to make beads to go around the lid and other parts of the teapot. You roll out a long sausage of fondant,which I had coloured blue, and simply press it into the mould and clip together. You then get a string of beads. I found this quite easy to use but the string of beads had a little excess icing around the edges, but if I used less fondant, then the beads wouldn't stay together. I'd be interested to know if anyone else has used one of these and what they think. I stuck the pieces on with edible glue. I also made a few cupcakes from the rest of the cake mixture and covered one with fondant upside down to look like a teapot. I rolled out another piece of fondant and cut it into a circle shape to be the saucer for the cup, and made a handle as before. Finally I used a flower cutter to make some blue flowers to stick around the sides of the teapot. I think it looks much prettier with this design than it would plain but how you decorate it is up to you. I'm sending this to Love Cake, the blog challenge hosted by Jibber Jabber, as the theme this month is 'giving up', and the idea is to make a cake without at least one of the following: eggs, butter, sugar or wheat flour. This cake uses no eggs or butter (though it does use vegan margarine). Tea Time Treats, run by Karen at Lavender and Lovage, and Janie at the Hedgecombers is with Janie this month and she has chosen to focus on decorative cakes. Chris at Cooking Around the World is returning to the UK as the theme this month and I don't think you can get much more British than a nice cup of tea! it is adorable... I would NEVER be able to make something so beautiful like this... I love the way it almost looks like it's inflatable, if you know what I mean... anyway, i'd like a slice please! Wow, well done, good job. I can understand that your friend was pleased with this cake. It sounds great with the buttercream and the flower design on the pot really add to the overall looks. Thank you also for entering Bloggers Around the World. Let me think, whether, it can get more British .... eh ... eh ... I don't think so. What a lovely cake, and perfect for a birthday treat. You are clever Caroline. This looks so cute and what a lovely birthday cake to make for a tea loving friend. It's a really pretty cake, even if it is a little wonky. I'm sure your friend was delighted with it. looks ever so good,aren't you clever----i could never attempt anything so complicated. I've been wanting to make a teapot cake for a while now. I think you may have just given me the confidence to do so! Also an excuse to go and buy some more cake tins! Thanks for linking up with this month's Love Cake. That is rather ingenious! I have never even attempted something this fancy! 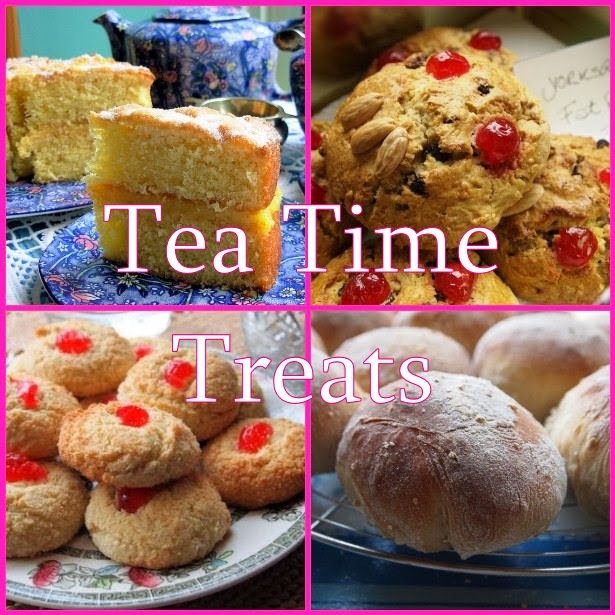 Thanks so much for sharing with this months Tea Time Treats.